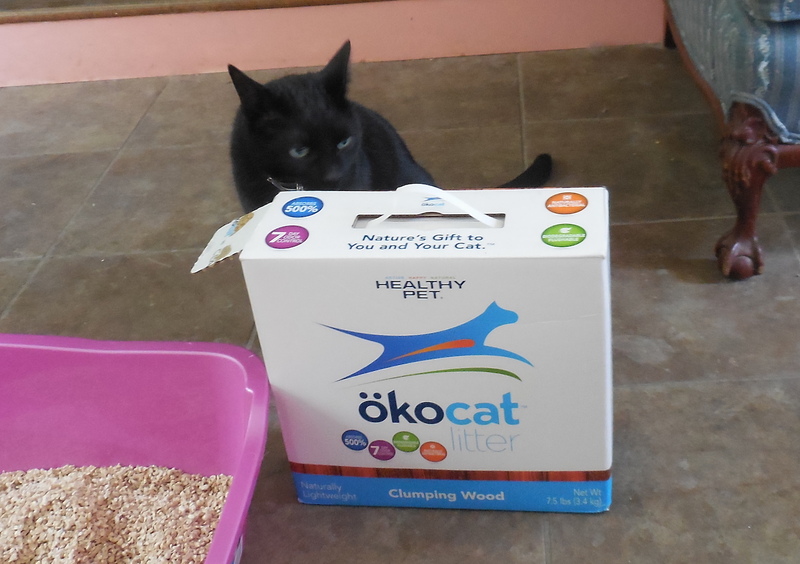 To be honest, I wasn’t sure how my cats would react to ökocat Natural Wood Clumping Litter. You see, I don’t generally use clumping litter of any kind. It tends to be expensive, and it doesn’t go far in a multi-cat household. So, I’ve stuck mostly to conventional clay litters. However, I wanted to be better than clay and I figured there’s a better option. Well, my cats surprised me. Thor, Tansy, Freya, Dervie and Moonlight began investigating it right away. Last time I tried changing litters, they walked away from the box in question, clearly insulted. They circled the box for a long time. 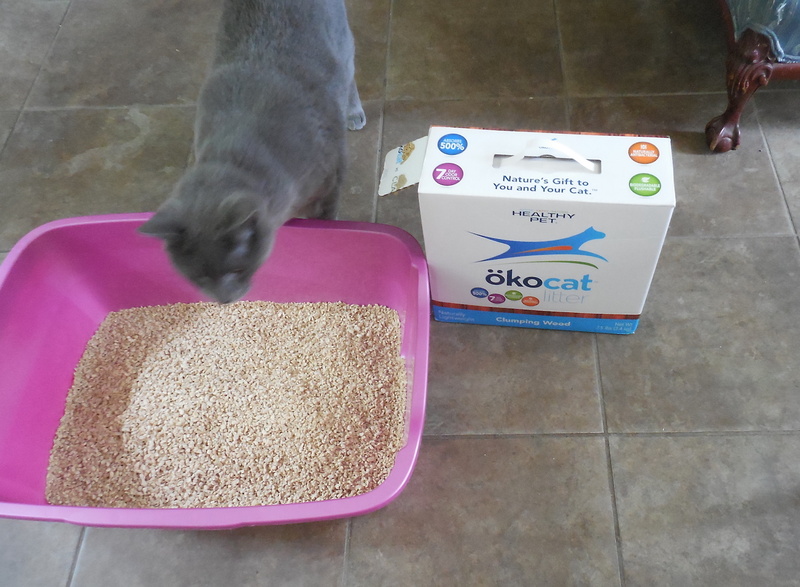 Then, after some careful inspection, they decided that the ökocat was fine for wetting. They haven’t used it for anything else yet, but this is no reflection on the litter: For some reason beyond my understanding, they already have one box that they’ve designated for solid wastes. 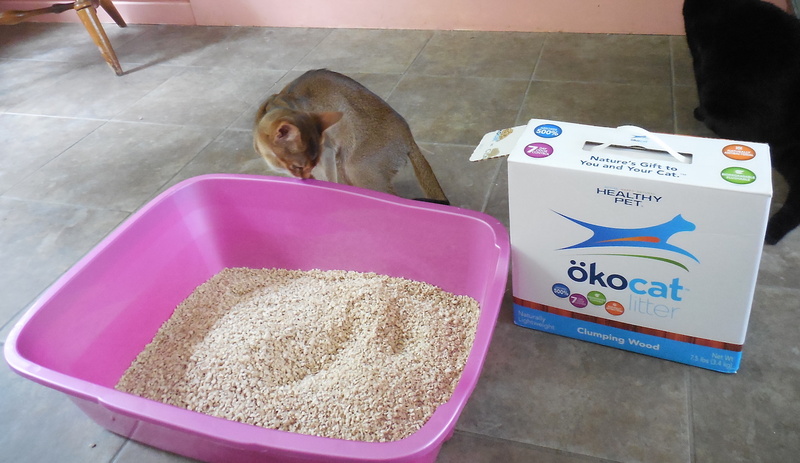 When it comes to cleanliness, ökocat has a lot going for it. First, there’s no odor. In fact, it has a 7-day odor control, which means the litter can be changed less frequently. ökocat sweeps up beautifully. There won’t be traces of it for your bare feet in the middle of the night to pick up the way that clay litter particles are. 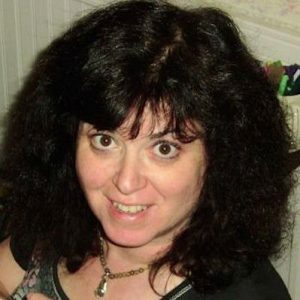 Your cats will not mysteriously track it onto your sheets, turning your bed into a sand box. The litter is also lightweight, which makes a big difference to your back when you spend a good chunk of time lugging large bags of clay litter out of the car and into the house. But the most important difference is probably environmental. In 2012, according to one study, 4.5 million tons of used cat litter went into landfills. (And, yes, right about now, I’m thinking of what I pitch into my garbage can on a weekly basis and wince.) The clay and silica that make up most nonclumping litters take close to forever to break down. ökocat comes from reclaimed fallen timbers (including spruce, pine and fir) and plant-based binders and is 100% biodegradable. The fibers come from suppliers that are compliant with the Forest Stewardship Council (FSC), Sustainable Forest Initiative (FSI) or the Forestry Preservation and Forestry Promotion Act. So, with ökocat, your cat can leave some nice green and eco-friendly paw prints. And here’s another plus: The oils from coniferous trees inhibit bacterial and fungal growth. Would I try ökocat again for my cats? Absolutely. I’ve talked with other people who have used it, and they are highly enthusiastic. Now, if you’ll excuse me, I have to go scrub the other litter boxes. The ökocat is making them smell — er, look — bad.